Yesterday, we saw the warning in the choosing to hate knowledge. Today, we continue through Proverbs 1:29. Earlier in Proverbs 1, it says that the fear of the Lord is the beginning of wisdom (v. 7). We can know that the entire knowledge block we have is because we aren’t fearing the Lord. What does it mean to fear the Lord? How do we know if we’re doing it? The fear of the Lord is often described as reverential awe or something along those lines. This is true, of course, but I’d like to dig in a bit and see if there’s a practical application of the fear of God we can lean on. Psychology Today says, “Fear is a vital response to physical and emotional danger—if we didn’t feel it, we couldn’t protect ourselves from legitimate threats.” We know that God is not someone we should be terrified of. There are so many scriptures that talk about God’s love and how much He wants to be with us and comfort us. Romans 8:38-39 tells us that nothing can separate us from God’s love. Therefore, we know that the fear of God isn’t something that would cause us to pull away from God. The Psychology Today definition points us to an interesting truth about fear: it is a vital response. In other words, we can’t do without it. If we didn’t have fear, most of the human race would have died off a long time ago due to not taking risks seriously. That cliff? Yeah, it’s along drop, so be afraid of it. Not afraid of the drop? More likely than not, you’ll get too close. This is what fear is for: making sure that what we need to be aware of to survive is clearly in focus. Let’s apply that idea to the fear of the Lord. Fearing the Lord should be creating a response in us that is vital to staying connected to Him. There should be a sense of urgency in being aware of Him. When we’re seeking Him and keeping fear of Him foremost, we are keeping what’s important to know Him clearly in focus. To see what not fearing the Lord would be then, we can flip the scenario. If you are complacent about your relationship with Him, or if you don’t know what’s important in getting to know Him, you aren’t feeling the fear of the Lord. You aren’t finding in yourself the vital response to His presence that motivates you seek Him out. What do you need to survive, not just on this earth, but more importantly, in the next life? Verse 29 tells us one other important things about the fear of the Lord: we can choose it. It’s not something that some people are born with and others aren’t. It’s not something that we get handed to us if we’re lucky. We can choose to keep this need for nearness as a focus. The fear of the Lord is something to be cultivated and emphasized. There are passages in scripture that I always try to apply 100% to other people. I don’t like to shine the light of awareness into my heart to see if there is a shred of reflection in me. 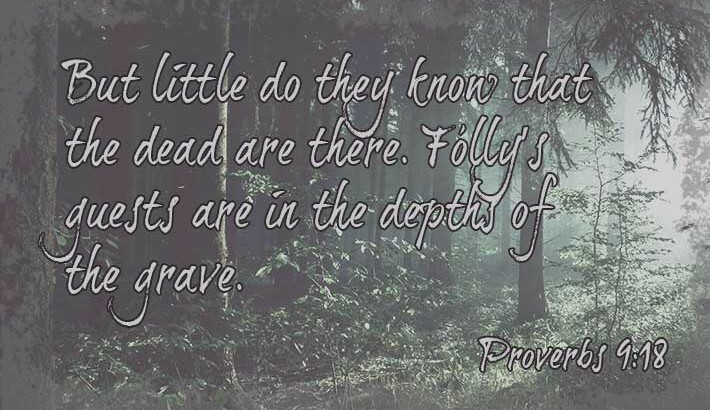 The passages in Proverbs that deal with sinners or the unwise are often in this category. I’m a child of God, and I’m good. Therefore, this is not me ever, under any circumstances. It’s only those bad people, over there, far away from me. How I wish this was true! No matter how long we’ve walked with the Lord, we will always have areas that the Lord wants to shine a light onto and show us how we can learn to let go of pain and self and be transformed to look more like Him. Proverbs 1:29-33 is one that often contains little bits of truth that we can turn over to the Lord for cleaning. Verse 29 uses the pronoun they which refers to simple ones or fool from earlier in the chapter (v. 22). Now the Lord is getting to specifically what the trouble is and what the consequences will be. The first aspect that we’re warned about is hating knowledge. It doesn’t talk about people who didn’t have a chance to learn or who were apathetic about learning. It’s referring here to people who hated it. Hate connotes not only avoiding it, but actively working against it. Knowledge is defined as awareness of facts, or familiarity with circumstances, events or subjects. So, those who are actively working against that choose ignorance of facts or circumstances. They don’t know and they don’t want to know and they are going to stop you from helping them to see. Knowledge can sometimes refer to what we refer to as traditional education, but it can be encompassing more than that too. Knowledge is what we need to have to help our families and our friends. Knowledge gives the ability to do well at our jobs, or to provide help to others. We gain knowledge in any area that we choose to become aware of and learn from. For us as Christians, we need to ask ourselves in what areas of our mind are we walking away from an awareness that the Holy Spirit is trying to bring to us. Are there subjects that we don’t want to bring up because we are afraid of what we’ll have to face? Are there situations that we only go emotionally in and not mindfully in? One defense that we bring up in this area is what psychologists would call confirmation bias. Basically, when we want to hear a certain thing, we seek out people and information that support the idea that we already have. Confirmation bias doesn’t want to hear that there might be other things to learn or that we might be missing certain pieces of information. We want to hear what we want to hear and we dismiss or fight against anything else. We can’t be changed when we are fighting against an awareness or knowledge. Change is a multi-step process and one of the key ones is the ability to see the difference between where we are and where we need to be. Confirmation bias always breaks that step because we are pursuing information that keeps us where we are. In fact, we don’t even want to listen to anything that would show us as being wrong. 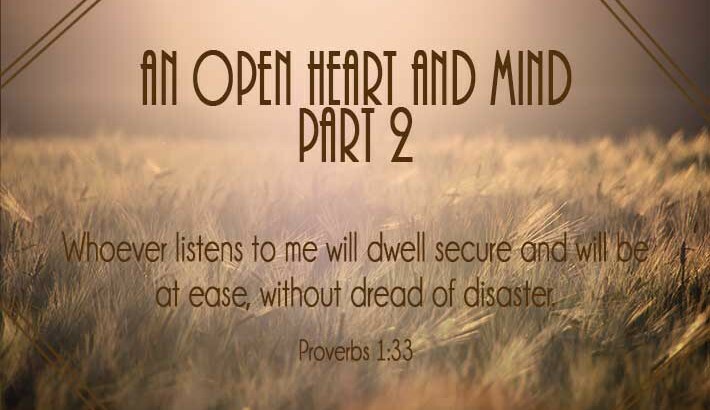 The book of Proverbs in the Bible is known for talking about how to be wise. Many of the proverbs talk about how to be wise, recognizing wisdom, etc. Many others talk about it from the perspective of warnings: what the foolish do and how not to respond to fools, things like that. In one particular case, it talks about folly (which means to have a lack of good sense or to be foolish) and gives us a story about what happens to those who listen to folly. It’s not a pretty one, but those who are wise can learn to avoid folly-filled behavior in others. First off, it says that, “the woman Folly is loud.” I don’t think there’s any significance to it beiung a woman as Wisdom is also called a woman in Proverbs. What’s important here is the volume. Foolish people are drawn to hoopla. This can be in the form of exciting entertainment; it can just be drama, television or real life. The next line of that verse says, “she is seductive and knows nothing.” So not only is she loud, but it’s empty words. Foolishness is hot air and emptiness. This is doubly dangerous because, to keep from realizing there’s nothing behind the entertainment, it must always be getting bigger and larger and louder (Vegas, anyone?). Wise people can see value in all ranges of moments of life, and don’t always seek out the high moments in life. In each and every moment of our days, there is beauty and joy and purpose, if our eyes and ears are attuned to it. The may not be exciting or seductive, to use Proverbs word, but it is far better to be filled with joy over real life than seduced by the joy of nothing real. The next thing Proverbs tells us about Folly is that she likes to be seen. She not only is out of the house (aka: not being productive, think about it, back then, women weren’t known for working outside the home…), but she’s also put herself in the place of the most conversation. She takes a seat on the highest places of the town. Places to be seen, places to see. She wants to be involved and chatting with anyone and everyone. Once she’s put herself in an obvious place, she tries to pull in (remember, folly is seductive) anyone she can. She starts with, “I know the easy way to do things! Come with me!” I’m all for finding better, more efficient ways of doing things, but Folly is asking for people who aren’t willing to work hard to pay attention to her. They want simply easy answers. Once she has them interested in that, she takes it to the next level, straight up lies. She encourages stealing and secrets. If you won’t work for it yourself, the next easiest answer is to take it from someone else. In addition, she fosters interest in secrets and secrets revealed (tabloids, yuck!). Finally, we have the plot twist at the end. All these things are bad, but we haven’t seen the cost of them yet. Now we see where all this is leading: death. She has lured them in with entertainment and easy answers and doing whatever you want to. What she doesn’t show them is the basement full of bodies. Her words are sweet and tempting, but her inevitable end is a slow death. We know that this sometimes means a physical death. Crime doesn’t pay and in-fighting among criminals ends up in their own deaths sometimes, think Jimmy Hoffa or Al Capone. More often, this is referring to a spiritual death. As we listen to foolish advice and seek easy, selfish answers, little bits of the parts of us that make us able to love and connect with others begins to die. Slowly, the love of ourselves takes over and we die to love with others. Because connection and relationships with others is what brings deep and long-term happiness, this eating away at the core of us is what finally leaves us empty shells of what we could be. Wisdom learns to avoid the alluring voice of folly and the temptation for easy and simple answers. Life is hard, good answers can sometimes be complicated. That’s ok. Let’s find the best way to life, the most connected and least selfish way to live. If there is folly driving your decisions, you must turn to the Lord and let fear of Him fill you. It is by knowing him that we can be wise and live long, healthy, lives. I need to be honest here and say this story is way down the list of favorite Bible stories. I find it unusual to say the least. But all of scripture is able to teach us (2 Timothy 3:16), so I started thinking about this passage to see how it can apply life. I thought about how we could glean things about not being jealous. Or how not gain at the cost of others. Or of the cost of not letting go during times of loss. However, let’s be honest and say that none of those things are what this story is supposed to be about, really. The bickering women are merely the stage setting for the real story: Solomon’s wisdom. 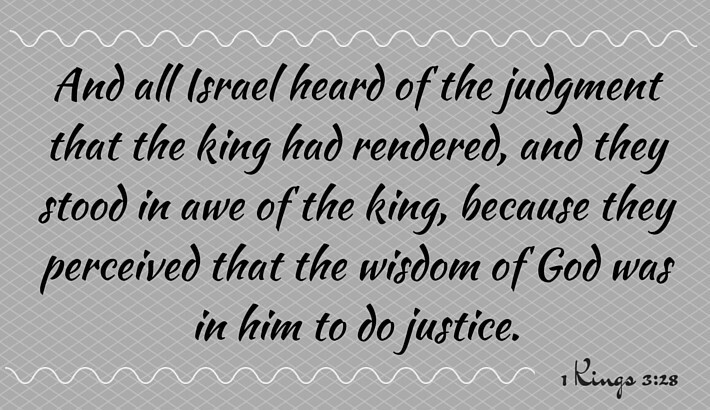 In fact, the last verse of chapter 3 says, “And all Israel heard of the judgment that the king had rendered, and they stood in awe of the king, because they perceived that the wisdom of God was in him to do justice.” (1 Kings 3:28 ESV) What the people who saw this event took away from it was not anything to do with conflict resolution or women’s issues or even weird discernment techniques. Instead, they saw the wisdom of God in Solomon. Why? I don’t know why two prostitutes were bringing their case to the King instead of an underling. Maybe they’d gone to all the people that were supposed to be dealing with them, and no one had been able to come up with an answer. Maybe they had “Free Visit with the King Day” in ancient Israel. Who knows what the reason was. But here they were and there was nowhere else to go. After the king spoke, it would all be decided, no appeals, no arguing. In this place of finding their final answer, Solomon did something important: he stopped listening to their words. Instead, he found a way to make them choose based on their professed beliefs. He knew they would talk incessantly and never budge an inch on what they claimed. So, he found a way to put rubber to the road and choose: the baby living at the risk of being with the wrong momma, or ending the child’s life. Solomon made them face a terrible, but very real choice. Kings with absolute power could kill anyone without being questioned by anyone. This showed their true colors. Not because Solomon reasoned with them, not because they were convinced to change their mind, but because of this: they had to act on their beliefs. One knew she was the child’s mother and the other was acting out of personal gain. Their reaction to that ultimatum was the revealing of their true heart. The mother sacrificed the most important thing to her in order to protect it. This is the root of Solomon’s wisdom, talk is cheap and action is revealing. Using that truth, I can easily see that there is wisdom to apply to my life. I can say what I want to say. I can pick sides in arguments. I can claim allegiance with certain groups of thought, political groups, or whatever else wants my time and attention. I can talk and think and believe. None of it matters, though, until you see how I act. Now, I don’t mean act in just any situation on just any day. I mean act when you’re back’s against the wall, where’s no other way out but through the battle, when the decision that is about to handed down is absolutely final, no do-overs. Then what? What becomes my priorities then? I can say that generosity is more important than any material goods, but when I’m down to my last dollar, where does it go? I can say that I believe all people are equal, but when it comes to letting them into my home, do I open my doors? Acting contrary to what you say has several names: if you do it on accident, it’s called naiveté. If you do it in full knowledge of the discrepancy, it’s called hypocrisy. Don’t live as a hypocritical Christian. When the pressure’s on and you have no other options left, be the person who’s actions are in line with their spoken beliefs. In the first chapter of the book of 2 Chronicles, Solomon is offered by the Lord anything he wants. Solomon’s response is that he would like the knowledge and wisdom to rule over Israel. Let’s take a moment and think about what just happened in this exchange. If the Lord, the most High God appeared to you and asked, ““Ask for whatever you want me to give you.” (2 Chronicles 1:7 NIV), would knowledge and wisdom be the first thing on your lips to request? Would you be more concerned about doing well at your job than health and wealth for you and yours? It might help to understand where Solomon is coming from if we look at his response to learn about his frame of mind when the Lord asked this question. In verse 10, Solomon says, “Give me wisdom and knowledge, that I may lead this people, for who is able to govern this great people of yours?” (2 Chronicles 1:10 NIV). The key phrase here is, “for who is able to govern this great people of yours?” It doesn’t say what exactly he’s feeling right now. What I do know is that when I use phrases like that, I’m feeling overwhelmed. When I look at the work ahead of me and say, “Nobody could get all this done in time!” or “I have no idea how this is going to happen! I wish I could make a copy of myself.” The days that I feel inferior or not up to the task, those are the days that I can most relate to what Solomon is saying here. Knowing that Solomon is feeling woefully inadequate also shows us a peek into God’s heart, as well. God knew that Solomon felt unworthy of the task. God also knew that Solomon walked with Him and honored Him. God’s heart to bless Solomon stepped it up right when the need was feeling overwhelming. When you are feeling at the end of your rope, what do you request of God? When your heart is burdened and hurting, what would you have God give you? Does the heart of a servant come out, or does selfishness take the first step? When we feel overwhelmed, we can learn a lot about our true heart by seeing what actions we take. Learn to be a humble servant before the Lord, even when you’re up against the wall. God will always step up and bless those who ask in humility. 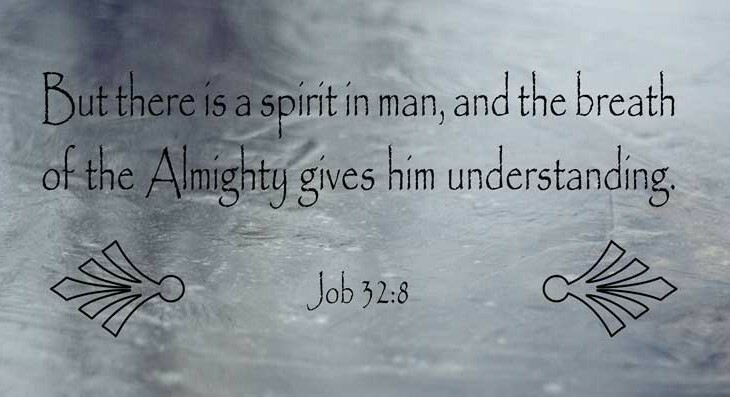 When we think of Job, we think of the man the book was named after: the sufferer who patiently insisted that he was not a sinner. There are several other characters in the book who are just as interesting, however. One being the young man name Elihu who understood what all the others didn’t seem to get: God first above everything. According to the book of Job, Elihu had been listening to all the conversations that have been going on and he is not ok with what’s happening. He’s upset at Job because he’s trying to justify his own righteousness instead of God’s (v. 2), and he’s upset with Job’s friends because they keep trying to be right even when they can’t find any proof their ideas are true (v. 3). I can relate to this frustration. I feel like I’ve been in so many situations where the people who were making decisions were the ones that simply wanted to do it like it always been done. Never mind that it stopped working (or never worked), or that there may have been changes since then. In those times, I knew that I could make a difference, but I wasn’t sure how to go about it. Sometimes, I said nothing and fumed in my mind. Sometimes, I opened my mouth and probably handled it badly. How I wish I could have had the wisdom of Elihu! Elihu decides to step in and remind them of the greatness and, more importantly, the sovereignty of God. What Elihu says is good stuff, but how he said it may be even more important. If you are feeling frustrated with people in your life who don’t seem to be getting things right, either older people or simply people in authority, Elihu models the appropriate response. When we hear others saying things that we feel aren’t beneficial, we often shut down and just start trying to push out our ideas (v. 7). Listening, however, is vital not only to relationship building with the others, but to double check your own ideas. Being young means missing out on one vital component: experience. Older people have it, and it’s very wise to make sure that you’re listening to them to make sure you understand their perspective. It doesn’t make their perspective right, but if you don’t take the time to listen to it, you are make it more difficult for them to listen to you and increasing the chance that your perspective is incomplete. Elihu knew that age was only one indicator of good ideas. He also knew that no matter who you were or how old that all good ideas came from the Lord (v.8- 9). You need to develop that same trust. Trust that God has put you where you are for a reason and that your ideas are relevant to what God needs accomplished. Don’t get arrogant and assume that you’re better than the previous people; you aren’t! Keep humility close and remember the Source. Once you’ve listened and acknowledged God, you can move forward with confidence in your ideas (v. 10). Think through things before speaking and put them out there with passion. You will still need to listen to the others and maybe even modify your thoughts based on what they say. Remember, experience is a teacher you haven’t had yet, so be wise and be willing to change if you run up against new ideas. The one thing you shouldn’t do is feel like you don’t have a right to speak. You do, because of who God made you to be and who you are becoming by humbly walking with Him. Apostle Paul gives his protégé similar advice in 2 Timothy 4:12, “Let no one despise your youth, but be an example to the believers in word, in conduct, in love, in spirit, in faith, in purity.” Live what you believe and be confident. God is with you. 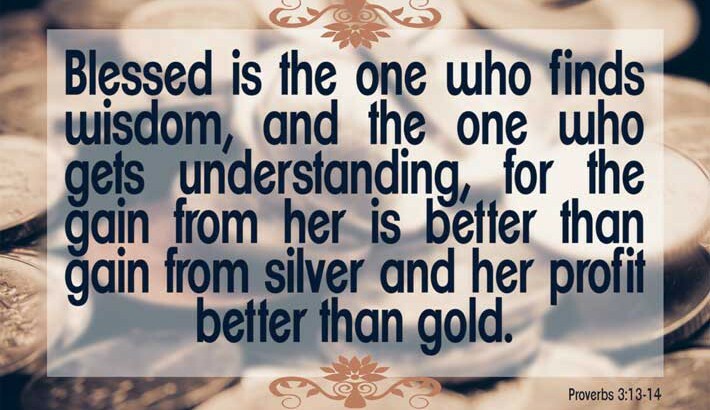 13 Happy [is] the man [who] finds wisdom, And the man [who] gains understanding; 14 For her proceeds [are] better than the profits of silver, And her gain than fine gold. 15 She [is] more precious than rubies, And all the things you may desire cannot compare with her. 16 Length of days [is] in her right hand, In her left hand riches and honor. 17 Her ways [are] ways of pleasantness, And all her paths [are] peace. 18 She [is] a tree of life to those who take hold of her, And happy [are all] who retain her. Psychology Today says about wisdom, ”Psychologists pretty much agree it involves an integration of knowledge, experience, and deep understanding that incorporates tolerance for the uncertainties of life as well as its ups and downs. Our wisdom level is indicated by how we react to our life circumstances. Some circumstances highlight wisdom more than others. I’ll keep off from serving others until I know for sure that I’ll be appreciated. I have no clue what’s happening so I’m going to go with the first thing that pops into my head. Probably that means the Lord is leading me. I don’t know why I said that when I did, I just felt so angry. Knee-jerk reactions to others hurtful comments (or even losing something like a phone or driver’s license). The salesman promised me I’d save $100 dollars, so I’m out to buy new shoes! My problems are so bad that there’s no one who can understand what I’m going though. I thought I’d be more honest, but when the person was looking me in the eye, I chose to lie rather than risk upsetting them. I don’t know how all the pieces of my life will come together, but I know what I can do right now to serve my family and others I come into contact, so I’ll start there. I began by asking others who had done what I wanted to do for advice before I just started moving without any direction. I was so angry that I asked to take a moment to myself to calm down before continuing the conversation. The salesman promised I’d save $100 dollars, so I’m waiting till I see that savings, then I’ll buy new shoes. The circumstances felt so overwhelming that I needed to take some time to remember what I’m grateful for so I didn’t lose my mind. The comments were hurtful, but I know that I’m supposed to love my enemies, so I was able to bite my tongue and just smile. Truth: The scriptures tell us that the fear of the Lord is the beginning of wisdom, so we know that we don’t have to be special people to get it, just have to seek with and have a deep respect for who He is. 10 The fear of the LORD [is] the beginning of wisdom; A good understanding have all those who do [His commandments]. His praise endures forever. 6 Behold, You desire truth in the inward parts, And in the hidden [part] You will make me to know wisdom. Truth: Wise people accept instruction, Proverbs 9:9, so we still have things to learn after being wise. Wisdom is the willingness to learn, not the ability to be right. 9 Give instruction to the wise, and they will become wiser still; teach the righteous and they will gain in learning. 10 The fear of the LORD is the beginning of wisdom, and the knowledge of the Holy One is insight. 7 Wisdom [is] the principal thing; [Therefore] get wisdom. And in all your getting, get understanding. Being wise isn’t about being right and it’s not about astounding others with our wit, cleverness or knowledge. True wisdom from God is based in fear of Him and an understanding of who He is. It brings awareness of Him, His nature, and His work. It even goes so far as to contradict the knowledge and ideals of human wisdom. Wisdom that comes with the knowledge of God also means that our words and our actions align. We don’t just speak words that sound good we live them out and the truth of God can be seen our living. 4 My speech and my proclamation were not with plausible words of wisdom, but with a demonstration of the Spirit and of power, 5 so that your faith might rest not on human wisdom but on the power of God. 6 Yet among the mature we do speak wisdom, though it is not a wisdom of this age or of the rulers of this age, who are doomed to perish. 7 But we speak God’s wisdom, secret and hidden, which God decreed before the ages for our glory. “Psychology Today.” Wisdom. N.p., n.d. Web. 23 May 2015. <https://www.psychologytoday.com/basics/wisdom>.